Teachers, please note: There are a couple of mentions about brothels and childhood sexual exploitation. PLEASE preview all activities and be certain that you are comfortable with the content. Consider the age-appropriateness of such topics. OFF-SITE RESOURCEWhat kinds of work do you do to earn money? How much do you earn? OFF-SITE RESOURCEWhat activities outside of the school day are you involved in? OFF-SITE RESOURCEWhat kind of Jobs are they doing? How much do you think they get paid? OFF-SITE RESOURCEBecause most of these kids work 7 days a week for 12-18 hours/day what experiences are these kids missing out on? Open Padlet questions (2) and collect responses. Show GoogleSlides with examples of the types of things child slaves are doing. Open the next Padlets (2) to allow student to respond. Watch video on child labor in India. Students will create their own PSA billboard against child labor. 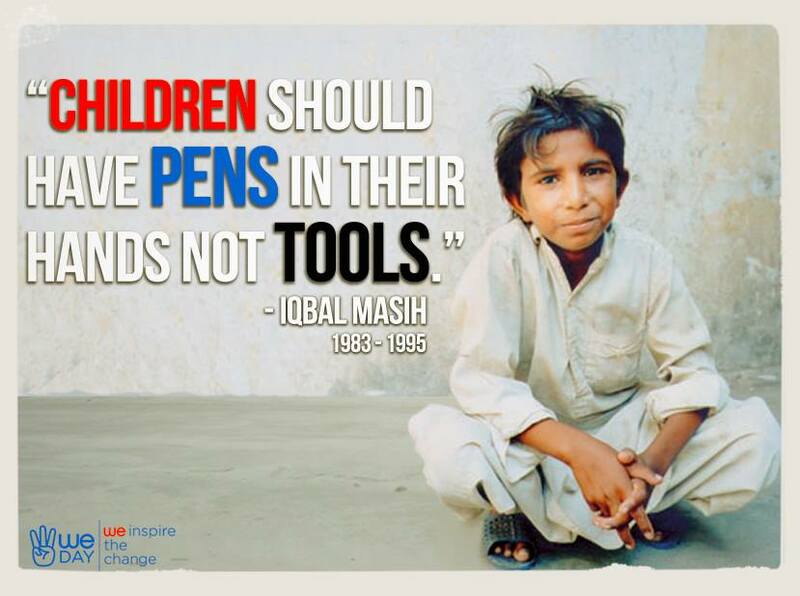 After today's lesson about child slavery/labor, how has your opinion about Iqbal changed?